At the bottom of vendor profile, there is an text box for you to insert your GA code. Question: what does this do? What kind of stats am I expected to see in Google Analytics? I don't have the luxury of trial and error at the moment. The dashboard, and all reports, are fully customizable, and they tell you exactly what is going on with... well, your whole site, really. 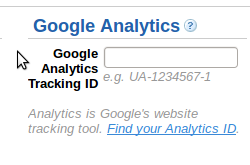 There's nothing another stat-tracking software can tell you that Google Analytics can not. Google Analytics on a web farm? How does the Google Analytics code run on Wix?